While researching how I was going to travel from Atlanta to Amsterdam during a sale through which I was going to save on the amount of SkyMiles which I was required to redeem, I noticed that one of the options was to stop off in Detroit, from which the new flagship Airbus A350 would depart — and as I had never flown as a passenger on that aircraft which Delta Air Lines took delivery only last year, I was curious and wanted to try it out. After an uneventful flight from Atlanta to Detroit aboard a Boeing 757-200 aircraft operated by Delta Air Lines, I finally saw the airplane on which I was to travel to Amsterdam. Unfortunately, the window was covered with dots for some reason; so the photograph of the Airbus A350-900 airplane which you see above was the best I could do to mitigate the appearance of those dots, which was mildly annoying. I arrived at my seat, which was by the window, as I usually prefer a seat by the window. A blanket wrapped in plastic and a pillow awaited passengers in each seat, which had adjustable headrests. The configuration in the economy class cabin is three seats across on either side of the aircraft, as well as in the middle. Universal electrical outlets with USB ports were available at each seat; and an additional USB port is built into the monitor of the in-flight entertainment system. Notice the stains behind the seat to the left of the electrical outlet which were never cleaned. The control panel above each seat included lights and adjustable air vents, which provided an adequate amount of cold air when fully opened. As passengers boarded the airplane, ample space was available in the overhead storage bins. The room available at each seat is adequate for many passengers — in other words, neither roomy nor cramped — and the monitors for the in-flight entertainment systems are adjustable. The most significant issue I had was the legroom — or lack thereof — underneath the seat in front of me as I sat in my window seat. I could barely fit both of my feet in the cramped space due to the configuration of the supports of the seat — and there was no way to stretch out my legs at all. I must have won the lottery that day, because fortunately, the middle seat next to me remained unoccupied for the duration of the flight, which gave me a chance to stretch my legs which I otherwise would not have been able to do had a passenger occupied it. Once again, stains appear all over the back of the seat in front of me, which indicates that the interior of this otherwise relatively new airplane was not properly cleaned. The winglets of this airplane are also known as sharklets due to their shape, which resemble the fins of sharks. Complimentary in-flight entertainment systems were available at each seat, through which passengers seated in all cabins can choose from dozens of movies, television programs, songs — or simply just use the customizable and adjustable moving map to track the trip. The touch display of the monitor works similarly to mobile telephones and tablets in terms of zooming in or out of the map. The refuse of the passenger during a prior trip of this airplane was never removed. After the menus were handed out to passengers by the flight attendants, Billboard earbud headphones — which are not pictured above but were reviewed by me in this article — and mini amenity kits which consisted of eyeshades and earplugs. Another sign that the cabin had not been properly cleaned was what I found when I opened the tray table: stains from the beverage of a previous passenger. Fortunately, the wet hot towels which were handed out by the flight attendants helped to clean the tray table — and yes, that is a hair on it; and it is not mine. For an airplane which is only 15 months old at the most, the “leather” upholstery should not already be separating from the rest of the seat, as seen in the photograph on the left. The photograph on the right shows what is supposed to be the appearance of the seat. The flight attendant served each passenger a package of Biscoff cookies and a snack mix, which consisted of cheddar tortilla chips, pretzel twists and cheese curls — which in my opinion are better than the offerings from the King Nut Company which had been served aboard airplanes operated by Delta Air Lines for years. I ordered the buratta, which is actually a jumbo ravioli. I wish I would have known that it was filled with cheese, which I do not like — but I was really in the mood for pasta; I was hungry; and both the Pomodoro and pesto sauces were just enough to help me mask the cheese flavor to the point where eating the meal was tolerable. I probably should have ordered the chicken instead. The meal came with a pretzel roll with a butter spread; a basic salad consisting of one grape tomato, lettuce and a few slices of cucumber and Caesar salad dressing; two types of cheeses with crackers and grapes which looked like they had seen better days; and a chocolate fudge brownie for dessert. Basic snacks were available in the back of the airplane during the flight overnight — including more of the snack mix and Biscoff cookies. 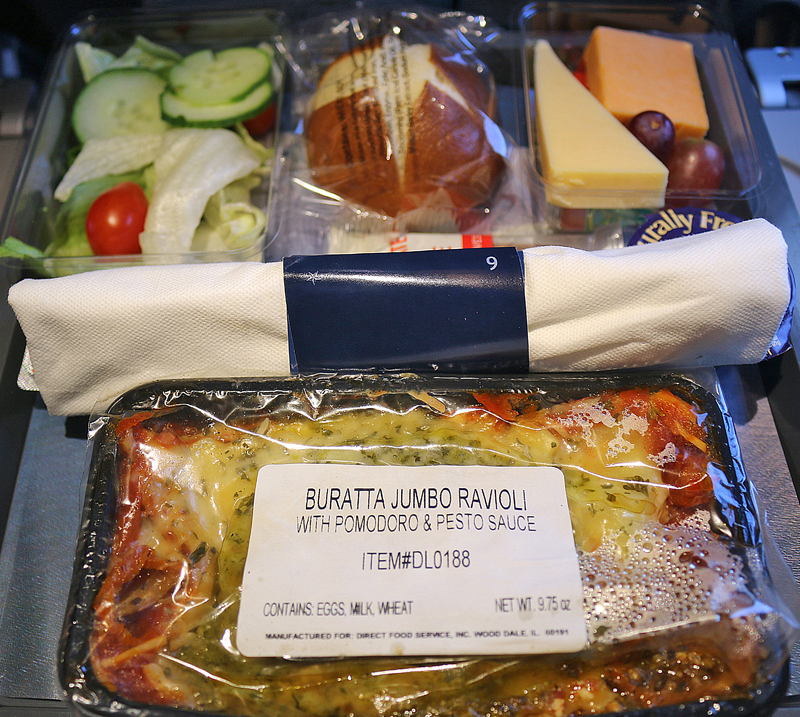 Approximately one hour prior to landing in Amsterdam, the flight attendants gave out a choice of either a warm egg and cheese sandwich or a continental breakfast box with breakfast bread and yogurt. …as well as dark chocolate mints and a moist towelette — although hot towels were provided to all passengers prior to this breakfast service. This flight was not up to the usual standards of which Delta Air Lines prides itself for three reasons: the legroom at the window seat was too cramped for a transoceanic flight; the cabin was obviously not properly cleaned and maintained; and the food — while adequate — was not the greatest I have ever had aboard an airplane. In my opinion, seeing the condition of the interior of this relatively new airplane is inexcusable at best. If you find yourself aboard the Airbus A350-900 airplane operated by Delta Air Lines, avoid the window seat at all costs if you value legroom. Between the overnight flight over the ocean and the wing outside of the aircraft, you are not going to have much of a view anyway for a significant duration of the flight. Besides, I much preferred being a “test pilot” of this aircraft in the flight simulator — especially when the instructor was not familiar yet with how it worked. Please refer to this article for details pertaining to my experience piloting the Airbus A350-900 aircraft in the flight simulator. Thanks for taking one for the team. I do prefer the window seat so will avoid this aircraft. I thought the “review” was all about Deltas ability to please this guy, NOT the A350, which is at the mercy of Airlines and how the kit out their aircraft. Gives the impression that the A350 is somehow to be blamed and avoided-this guy work for Boeing? Next time try the A350 with Qatar or Singapore Airlines. To me, the A350 is the best. “Jewel of the Skies” maybe this guy should try out the 737max8!!!!!!!!! If your assertions were true, that guy — er…I mean john russell — I would have titled the article Why I Was Unimpressed With the Airbus A350-900 Aircraft in General. burrata is a famous type of italian Mozzarella… so it was easy to understand that agnolotti were filled with cheese. agnolotti is a type of fresh egg pasta filled with cheese or meat. As a vegetarian option, itcould be filled only with cheese. I actually never heard the term buratta before, Marco TD; but thank you for the meaning. Actually, a suitable vegetarian option for me would have been mushroom agnolotti. Although I did not like the cheese, I was really in the mood for ravioli; so I took it. The other options did not sound all that appetizing to me anyway. Pro Tip: If you don’t like cheese, don’t order buratta. Always disappointing to sit in an uncleaned seat, especially for a long haul. That footspace does look awful cramped, good to know. Buratta is actually a type of italian cheese, so I would mark that one off your future ordering list. Everyone wants IFE but they don’t realize it comes with a price – the space in the footwell. I know I’m in the minority but I’m capable of entertaining myself so I’d MUCH rather than the space for me legs/feet back and also not have to deal with a woodpecker tapping the back of my head all flight. Dump the IFE. Also was the aircraft much quieter as they say it is ? No, I did not, Jim; but I looked at it just now and saw no indication that there was anything wrong with the seat in which I sat. It is classified simply as a standard seat. I also must admit that I did not notice the aircraft being any quieter than others; but that may be due to the fact that my window seat was right next to the wing where one of the engines is located. In about a month, we are flying a Delta A350-900 from ATL to ICN and then ICN to ATL on the return. But we are flying in the Delta One Suites so it should be a better experience. We are not thrilled that we are going to to be at ICN for about 9 hours each way to/from SIN. Have heard that vegans like us don’t have food available at ICN. I am not a vegan, David; but South Korea is known for such dishes as kimchee, which I initially thought was vegan — until I realized that it can be prepared in a fermented seafood product such as fish sauce. Still, I am surprised that no vegan food options are available at Incheon Airport. Although I have been to that airport, I am not vegan; so I would not know. Can anyone corroborate that no vegan food options are available at that airport? I am a retired Delta Flight Attendant 41 years. In the past, five years it was very clear to the Flight Attendants the planes even for International were not being really being cleaned. It is cursory at best. If a plane has a longer turn time it can be more thoroughly cleaned but this is the exception, not the rule. One of my last flights before I retired on January 1st, 2019 we were running late and the plane was trashed. The Gate Agents wanted to board the flight without cleaning. Luckily, the Captain stepped in and told the cleaners to get to work. This is also the exception rather than the rule.